I generally like to go to the various trade shows throughout the year to see what is trending in the Wedding industry, what new vendors I may be able to work with and just to be creatively inspired. This year I chose to attend two tradeshows and as I was making my way down I decided to view each tradeshow through the eyes of a bride. I attended two bridal shows Canada’s Bridal Show and the Total Wedding Show just to see if I experienced the the same emotions and sensations. 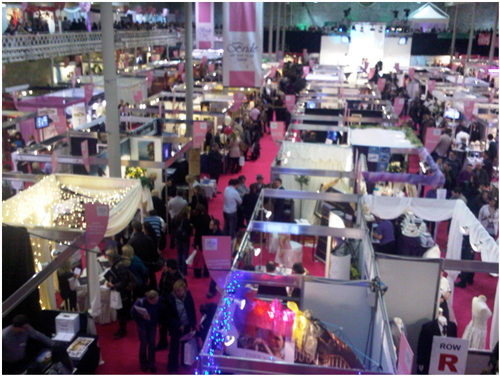 Attending a tradeshow without a plan can leave you with an overwhelming sensation of not knowing how or when you are able to plan your wedding. I came home with two full bags of information, free samples and not even knowing where to begin in sorting through all the “stuff” I received. 1. Take some time to enjoy your excitement of getting married; there is no rule that says that as soon as you get engaged you must begin planning your event. 2. Start creating a vision for your wedding; this will give you a focal point for your wedding, so that as you begin to source vendors you can stay on track with the look and feel of your wedding. It is really good to keep it in the form of a board that you can add or remove images from. 3. Have a plan as to what you are looking for when you attend a tradeshow; you must remember that for all the vendors who are showcasing at the show this is there way to acquire business. So they will be giving you as many specials and deals to have you hire them for your wedding. 4. Use the tradeshow as a space to be inspired and get ideas, if you see something that a vendor is offering and feel that it will fit the vision of your wedding; get the vendors card and contact them afterwards. 5. Try not signing any contracts at tradeshow; it is important that you have the proper time to review the contract that you are considering signing. Ask to set up another meeting to go over the contract and what services you are specifically hiring the vendor to provide.